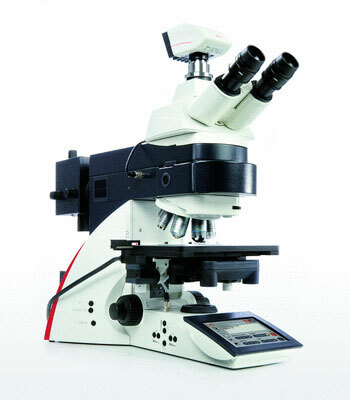 With motorized z-focus, motorized and coded 7x nosepiece, fully automated transmitted light axis, and fully automated 5x or 8x fluorescence axis, the automated Leica DM6000 B research microscope provides all transmitted light contrast methods including a fully automated Differential Interference Contrast (DIC). What i sunique is the ability to recall a particular contrast method with an objective, i.e., the system can recall DIC in combination with 63x magnification, which provides reproducibility. The motorized Z drive offers the convenience of automatic parfocality adjustment, saved focus levels, and automated positioning of Z levels.